We’d love your help. Let us know what’s wrong with this preview of The Beloved World of Sonia Sotomayor by Sonia Sotomayor. Discover the inspiring life of Justice Sonia Sotomayor, the first Latina and third woman appointed to the United States Supreme Court, in this middle-grade adaptation of her bestselling adult memoir, My Beloved World. Includes an 8-page photo insert and a brief history of the Supreme Court. Sonia Sotomayor was just a girl when she dared to dream big. Her dream? To become Discover the inspiring life of Justice Sonia Sotomayor, the first Latina and third woman appointed to the United States Supreme Court, in this middle-grade adaptation of her bestselling adult memoir, My Beloved World. Sonia Sotomayor was just a girl when she dared to dream big. Her dream? To become a lawyer and a judge even though she'd never met one of either, and none lived in her neighborhood. Sonia did not let the hardships of her background--which included growing up in the rough housing projects of New York City's South Bronx, dealing with juvenile diabetes, coping with parents who argued and fought personal demons, and worrying about money--stand in her way. Always, she believed in herself. Her determination, along with guidance from generous mentors and the unwavering love of her extended Puerto Rican family, propelled her ever forward. Eventually, all of Sonia's hard work led to her appointment as an Associate Justice of the United States Supreme Court in 2009, a role that she has held ever since. To ask other readers questions about The Beloved World of Sonia Sotomayor, please sign up. I really liked this book...Sotomayor is an impressive woman, and her story is certainly inspiring! Although this is the YA version, it did not feel watered down at all...still almost 350 pages. I would recommend it without reservation to adults as well as students. Sotomayor was raised by a single mom and by her "abuelita"...her loving grandmother. On her nurse's salary, her mom was able to send her to a Catholic school and from there she went to Princeton and on to Yale law school. She also writ I really liked this book...Sotomayor is an impressive woman, and her story is certainly inspiring! Although this is the YA version, it did not feel watered down at all...still almost 350 pages. I would recommend it without reservation to adults as well as students. Sotomayor was raised by a single mom and by her "abuelita"...her loving grandmother. On her nurse's salary, her mom was able to send her to a Catholic school and from there she went to Princeton and on to Yale law school. She also writes about being a prosecutor and then working in a private law firm before becoming a judge. My only disappointment with the book was in the fact that she only touches briefly on her appointment to the Supreme Court. I want more on that! I'm ashamed to admit that I had not cared about reading about Sotomayor's life. I enjoyed reading this abridged (YA) version of her book as it gave me insight into her upbringing and background. Review to come! This was such an excellent read!!! **This was included as part of my assigned reading as a reader for the Garden State Teen Book Awards (GSTBA) -part of the New Jersey Library Association (NJLA)'s Young Adult Services Section (mouthful!). We read and propose/choose which books will be included on following year's ballot. The teens then vote for their favorites and the winners are notified in time for our annual conference. ** This is really cool; so, check us out if you live in NJ Review to come! This was such an excellent read!!! Sotomayor may say that she couldn't write essays well, but she has created an interesting story about her own life. This is not a stripped-down version of her autobiography, but instead an appropriately Young Adult edition. That said, it does get a bit dry in places as it describes experiences as an attorney. It also only covers up until she first becomes a judge, so there's a chance for a sequel. I am impressed with her ability to tell a story--beginning and ending with her diabetes as well as Sotomayor may say that she couldn't write essays well, but she has created an interesting story about her own life. This is not a stripped-down version of her autobiography, but instead an appropriately Young Adult edition. That said, it does get a bit dry in places as it describes experiences as an attorney. It also only covers up until she first becomes a judge, so there's a chance for a sequel. I am impressed with her ability to tell a story--beginning and ending with her diabetes as well as other parts of her life. "The challenges I have faced - including material poverty, chronic illness, struggling to learn English, and being raised by a single mom - are not uncommon. For many, it is a source of hope to see someone realize her dreams while bearing such burdens. People who live in difficult circumstances need to know that happy endings are possible." 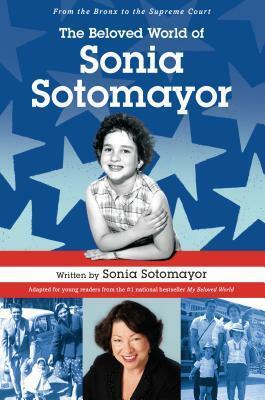 The story of Sonia Sotomayor's younger years and early career is both interesting & inspiring. I was a little bummed that this only covered her early career years (I was hoping for some tidbits regarding her time as a SC justice). An interesting and inspiring story, which was great to read in conjunction with Michelle Obama's Becoming since they both touched on similar themes. There were a few references to Sotomayor's marriage that seemed like they'd either been cut out of this middle grade version, or were just poorly explained. but that's a small quibble, and one I don't think the intended audience would care about. 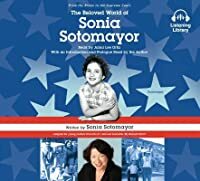 I am not a big nonfiction fan, but between "Becoming Michelle Obama," "Notorious RBG," and now "The Beloved World of Sonia Sotomayor," I am SOLD! This outstanding audiobook will floor you. I cannot get over the obstacles Sonia had to overcome in order to survive and THRIVE. What an incredible role model, and what an incredible story. HIGHLY recommended (along with "Becoming..." and "Notorious..."). Now all I need to find is Elena Kagan's story! Great memoir! Provides a detailed picture of her early years and into college and first jobs. I appreciated the details of her mom's life, her father and his death, her dealing with type 1 diabetes, her college experiences as an other in a non-other world, and her decision process about her lawyer jobs. This was a very good book for the MS/HS reader. She didn't have a great childhood at all, but set her goals and was not deterred from them. All of her hard work has paid off. Yes, she had setbacks in her career, but it only made her strive harder, listen to her mentors and be successful the next time. Truly enjoyed learning more about Sonia Sotomayor's story. I knew very little other than her current position and status as "a first," so I was glad to get more background. Readable and very interesting. Phenomenally fantastic! It should be required reading! LOVED getting to know the Justice through this. It is READABLE and RELATABLE. Something EVERY little girl should read. Absolutely inspiring! Very easy to read and interesting. I learned a lot about Justice Sotimayor and her life.